tattoo wrote: I will start by saying this past weekend was bad enough to experience, i dont need to hear what I did wrong. It will NEVER happen again. I want to post my story so maybe it wont happen to anyone else. Please don't beat me up. I am so sorry that Tattoo, you and your husband went through such a terrible thing. I am sure you are still having nightmares. I know that this happened over a year ago but I was anxious just reading it! So glad it was a happy ending. 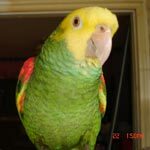 I am a new parrot owner and it reinforced the importance of taining it to wear a harness. animal_lover wrote: I know that this happened over a year ago but I was anxious just reading it! So glad it was a happy ending. I am a new parrot owner and it reinforced the importance of taining it to wear a harness. That shows how much you want to learn that you would go back in the history of the forum to catch up. Oh God, that is one scary story. My budgies are clipped. I don't know what I'd do if that happened to them. Thank god you found him! AlbertaAviary wrote: Oh God, that is one scary story. My budgies are clipped. I don't know what I'd do if that happened to them. Thank god you found him! Why are they clipped? Clipping does not prevent flying. It is just a mutilation to make their lives miserable. liz wrote: Why are they clipped? Clipping does not prevent flying. It is just a mutilation to make their lives miserable. This is true on all accounts. I was over an acquaintance's house who clips her birds and the bird was able to glide/flap with no wind a meter or so. Outdoors with a draft they can go much much further. Also it was incredibly pathetic and sad watching the little Meyer's try to fly with her very, very clipped wings. :[ Broke my heart.